Please do not adjust your screen! LOL! 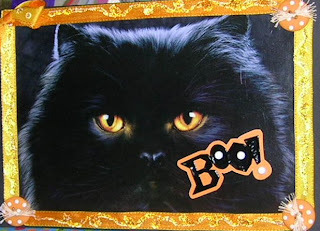 These are some Halloween cards I made last year. Now, remember how I've gone on and on about how I don't have any scrapping supplies with me? Well, I had them last year, but I had just STARTED making cards. Before that I was a diehard scrapper, so bear with me! 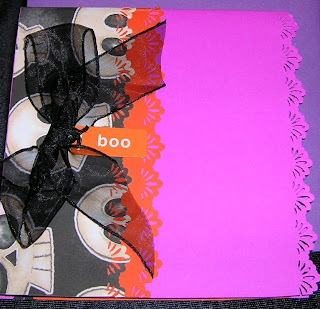 :) I've always admired Heidi's style of card making. For lack of a better word, I've always called it shabby chic and I just love her cards! I've always wanted to be a shabby chic kind of gal, but I've been told that I'm eclectic with a heavy emphasis on cutesy. Geez, I hope that's a good thing! 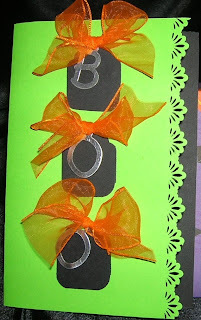 Supplies: Cardstock; OTC alpha charms; organza ribbon; Fiskars border punch. I made this next card for my sister, Eva. She is not a cat person either! LOL! I call it a "re-card" because it's a picture of a card I'd received before and I thought it was too wicked awesome to just sit in a drawer! I bought this textured felt and HAD to use it! 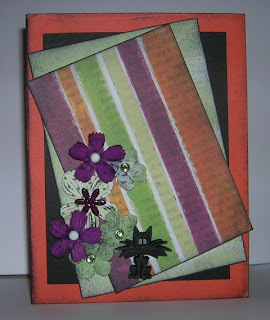 And ok, I went a little crazy with my Fiskars border punch, what can I say? When I like something, I use it! :) You can't tell from the photograph, but I glazed the eyes and so IRL they are very shimmery and raised. Supplies: Cardstock; textured felt; Leaving Prints die cut; floss; Miss Elizabeth's brads; glaze; Fiskars border punch. 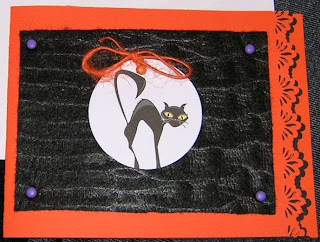 Supplies: Cardstock; organza ribbon; Fiskars border punch; Miss Elizabeth's metal charm; OTC PP. Supplies: Cardstock, Miss Elizabeth's brads; Leaving Prints diecut and tag; organza ribbon; Fiskars border punch (yeah, again!). This one I actually made this year. Can you see how I've evolved? Spooky, isn't it? :) I made this with the emphasis on making it Halloween-y looking without coming out and saying it. Did I get the message across? 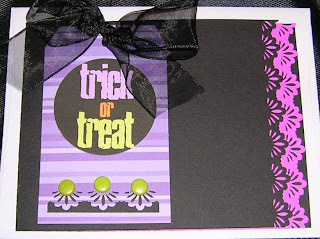 Supplies: Cardstock; Reminisce PP; Prima flowers; MM, brads; Dress it Up button; black ink. OK, so next week, I'll post some old fall-y cards and then I'll be back in NH and will be able to show you the REAL damage I can do! LOL! Yeah, in case I hadn't said this before; I'm going home! I made a go of it in Albuquerque, but it didn't work out and so I'm heading back. I've updated all my info to reflect that I'm in NH already just cause I'm impatient! LOL! But, I actually won't leave until November 3rd. This coming weekend I'm going down to Texas to visit my family one last time before I head up north. I'll share all about my visit with you next week! Look forward to it! LOL! These are all great cards!! When I look back on some of the cards I first made...I am shocked that I continued to make cards...lol. I have that fancy punch and have never used it....you've inspired me to get it out. Hi Ema...I tagged you..check my blog..